Pickens County was established on December 20, 1820, and named for revolutionary war hero General Andrew Pickens of South Carolina. The county seat was relocated from Pickensville to Carrollton in 1830. The first courthouse in Carrollton was burned on April 5, 1865, by troops of Union General John T. Croxton. Pickens County is home to the Aliceville Museum and Cultural Center which houses artifacts from the Aliceville WWII POW camp. 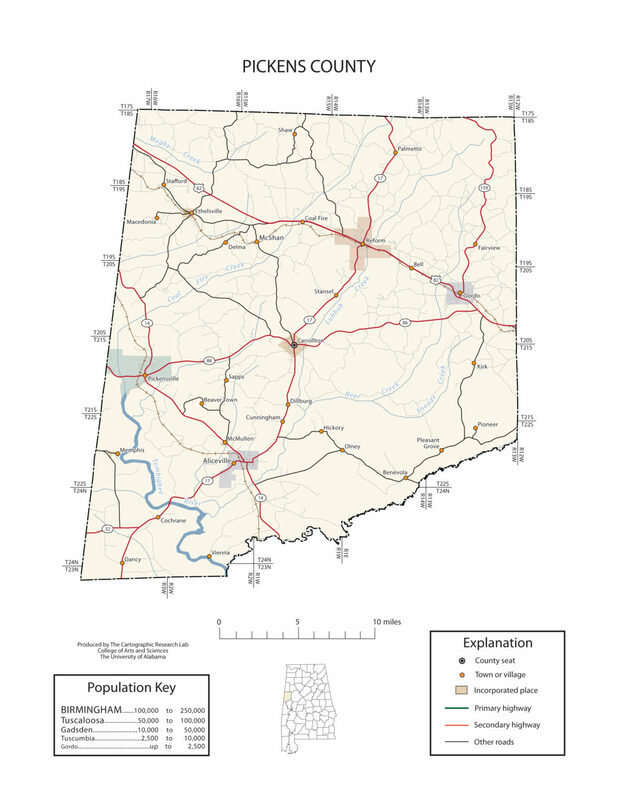 The county also contains Aliceville Lake and part of the Tombigbee River. The construction of Camp Aliceville began in August 1942 and was completed by December. The camp began receiving German POWs, at first mostly from Erwin Rommel’s Afrika Corps, in June 1943. It comprised 400 wood-frame barracks, which could hold as many as 6,000 prisoners and 900 Army personnel. Aliceville was the largest of the eleven POW camps in the Southeastern U.S. By the end of the war Camp Aliceville held German prisoners captured in many different locations. September 30, 1945. The camp was dismantled and sold for scrap after the war, and its only remaining trace is an old stone chimney. Many people have wondered how the city of Reform, Alabama came by its most unusual name. In 1819 there was a rawhide settlement where Reform now stands- a settlement with a few shanties and a reputation for being rough and rowdy. Lorenzo Dow, an itinerant Methodist preacher, visited and attempted to hold a religious revival. He met with no encouragement from the local men who were not very religiously minded. With disgust Parson Dow closed the religious service he was attempting to conduct, saddled his horse, mounted it, and was riding away when one of the men called after him, “Parson, we don’t have a name for our town; what would you suggest?” The Parson shouted, “Reform”, and rode away. The Reform name stuck. The town of Reform was incorporated in 1898 and has been a town of which the people have been proud. The people have not lost the pioneer spirit, and the optimism with that spirit is still evident. They appreciate the opportunity to play a part in improving this, their community. Carrollton was founded on 80 acres of land given to Pickens County by the federal government in 1830 to establish a county seat, land formerly occupied by the Choctaws. The town was named after Charles Carroll of Maryland, the last surviving signer of the Declaration of Independence, and was officially incorporated on January 15, 1831. The first county courthouse was burned on April 5, 1865 by Union troops during the Civil War, and the second in 1876, by arson. It was replaced with a new structure in 1877 that was used until 1994, when a new facility was built. The old courthouse building still stands. Ethelsville, originally called Yorkville, was one of the earliest settlements in the state and also the location of the first Baptist church in Pickens County. It took its current name from Ethel Hancock, who was the daughter of local physician J. T. Hancock. His son Thomas was the town’s first postmaster. The town was incorporated in 1952 or 1956, depending on the source. It was still an active railroad stop when it was incorporated, with four freight trains and six passenger trains stopping there daily. After the railroad no longer stopped in Ethelsville, the population began to decline. The Town of Gordo is situated astride U. S. Highway 82 in West Alabama just 25 miles from the Mississippi border. The first settlers to the Gordo area arrived in the 1830’s. The community grew around an area that was called Crossroads, which was at the intersection of the Columbus-Tuscaloosa and Vienna-Fayette stagecoach roads, which today is located one mile northeast of Highway 82. The community relocated to the area around the new Mobile and Ohio Railroad in 1898. The town incorporated in 1900-01 and the first Mayor was John J. Windham. In 1910, Gordo was the largest town in Pickens County with a population of 707. Gordo is also home to a fast growing community of artist and is becoming a destination for groups that want to enjoy this art in our three art studios, Studio 121, Studio 150 and Studio 134. McMullen is a town in Pickens County. The population was 10 at the 2010 census, down from 66 in 2000. It incorporated around 1976. A series of natural disasters has caused the population to dwindle. 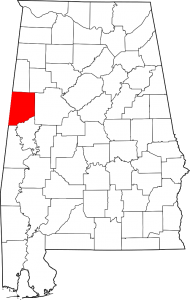 As of 2010, it is the smallest incorporated town in the state of Alabama. Memphis is located in southwestern Pickens County in the west-central part of the state on the Tombigbee River just east of the Mississippi border. The population in Memphis according to the 2010 Census was 29. Of that number, 100.0 percent of respondents identified themselves as African American. Memphis was established in 1841 by James William Wallis. It had been a thriving port town on the Tombigbee River. It had a ferry that also was called Memphis, and the busiest landing was Jackson’s Landing. Cotton was the main export item, and steamboats brought in essential supplies. Pickensville is the oldest town in Pickens County, with a post office established in 1823. The town was named county seat even before it incorporated in 1825. It lost its designation as county seat in 1830 to Carrolton. Pickensville Campground is located just west of Pickensville, Alabama, on Aliceville Lake on the Tennessee-Tombigbee Waterway. This campground boasts both a campground and day use area with many activities and amenities for families and outdoor enthusiasts. Visitors enjoy hunting, fishing, picnicking, water sports and watching the barges go by on the waterway.